Quran contradictions #1: What did Allah use to create man? In the same vain as my bible contradictions, I submit the first quran contradictions. This entry was posted in Atheism, Quran Contradictions and tagged Atheism, Bible Contradictions, God, God of Abraham, Islam, Quran Contradictions, Religion, Shia, Sunni. Bookmark the permalink. 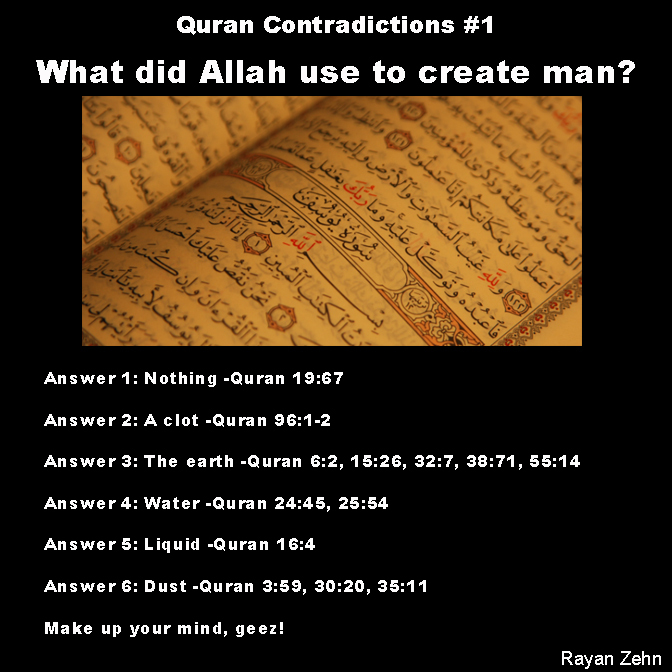 9 Responses to Quran contradictions #1: What did Allah use to create man? I cannot believe you wrote the above without even conducting any research?.. Thank you for giving me more material to write about!! sure, I think you have some confused inner hate, which you projected to others with weak disinformation. Generally stems from a corrupt mind. I have read far better theological arguments. I don’t make theological arguments. Yes, just general waffle. And its purpose? – As written above, to cause disinformation. The truth is that god made man out of NOTHING BUT A CLOT BLOOD A LIQUID THICKER THAN WATER AND DUST/DIRTS FROM THE EARTH.BOOM!